As a budget laptop, the 100S-11 has a lot going for it, but it's hamstrung by its tiny amount of storage space. Sight unseen, what would be your expectations for a laptop that costs only $180? Come on, be honest. Probably lower than dirt. Well, if I were talking about the Lenovo Ideapad 100S-11, you'd be dead wrong—at least until you ran up against its inadequate storage. I came at the 100S-11 from the opposite direction. I was hands-on long before I knew the price, so it came as a surprise. There’s no cheap or plastic vibe to this product, and the performance, while far from scintillating, didn't give anything away. (Okay, the display's not that great, but it is usable.) It was only when Windows 10 complained that it didn't have enough disk space to upgrade that I started to clue in. What the 100S-11 truly is, like HP's Streambook 11, is a netbook that has come of age. The storage is kind of a deal-killer, though: The 100S-11 we tested had only a 32G eMMC (embedded MultiMedia Card) drive, which will frustrate you unless your computing needs are extremely light and will always remain so. It also makes me wonder whether the people who decide on the specs ever actually use computers. Lenovo's spec sheet says there’s a 64GB version, but I couldn't find it online. What’s nice about the IdeaPad 100S-11 is just about everything on the outside, and aside from the storage, everything on the inside. The 11-inch, 1366x768 non-touch display has enough usable brightness (200 nits), and the backlighting is fairly even and doesn't leak along the sides. Because the viewing angle is quite narrow—"quite" as in "possibly annoyingly so"—your best views will be from dead center. For $180 I can live with it. If it were $100 more, I'd take an extended tour of gripe city. You won't have to worry about sliding the 100S-11 into narrow cases. The 100S-11 is decently thin at 0.75 inches, decently light at 2.2 pounds, and feels solidly constructed. It’s very good-looking, styled in matte-black paired with either red, silver, or blue on the top and bottom. As far as input goes, I would've done dirty deeds for a keyboard this nice during my sole foray into netbook ownership. It’s spacious, types well, and even has decent tactile feedback. It does Lenovo proud, which I haven’t been able to say about some of its previous efforts in the mobile device space. The touchpad is a little sensitive to taps for my taste, but I don’t have any real complaints. I’m going right back to that 32GB eMMC drive. 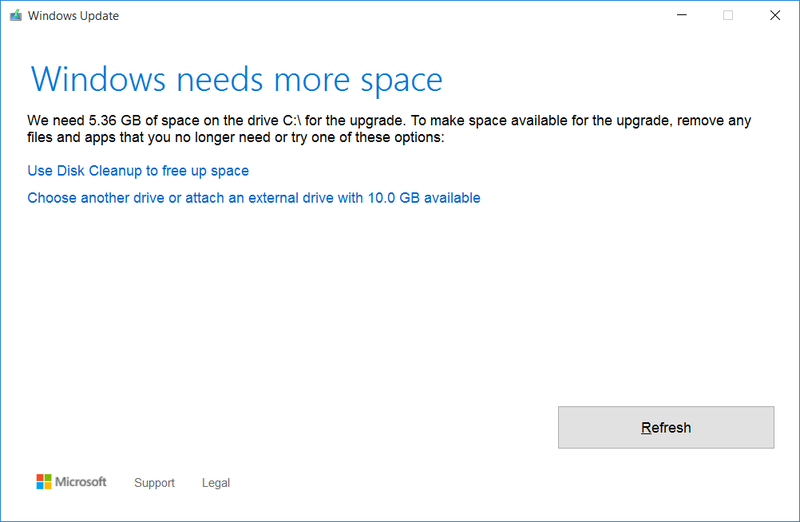 You have to plug in an external drive to upgrade Windows, for goodness sake! You'll want the 64GB 100S-11 when and if it ships. This is one of the many reasons you don't want a Windows laptop/netbook with only 32GB of storage. Second on the list of weak points is the sound through the speakers. I won't waste adjectives on it. Just carry around some earbuds, headphones, or an external speaker if you want decent sound. Our test unit had a red lid, but you can opt for blue or silver instead. 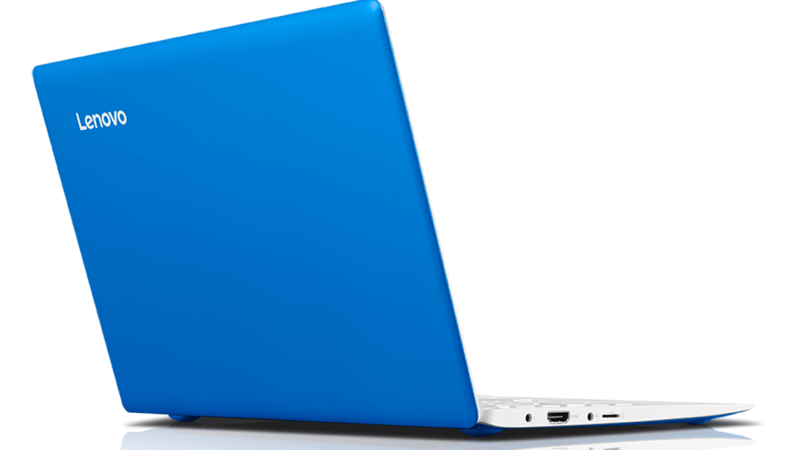 Whatever the color, the 100S-11 is a nice-looking notebook. The basic components of the 100S-11 are an Intel Atom Z3735F CPU, 2GB of DDR3/1333 memory, and the aforementioned 32GB Samsung BGND3R eMMC drive that tested about 25 percent quicker than a fast hard drive. The port array consists of two USB 3.0 types, a single micro-HDMI for display output, a headset jack, and a micro-SDHC card slot. Wi-Fi is 802.11 b/g/n and there’s Bluetooth 4.0 on board. You can augment the capacity-challenged eMMC with external USB 3.0 storage or micro-SD cards. I’ve never liked the latter solution, because something always accidentally ejects them unless the slot is internal, and the 100S-11's is not. Murphy's Law guarantees this. You want the 64GB model, really. Though there were some short waits, I never had the urge to throw the 100S-11 out a window, as I often did when waiting for older generations of netbooks to perform simple tasks. It gets things done, though not at Core i7/SSD speeds. It can even play a high-bit-rate 1080p movie. The original netbooks choked on 720p content. The test numbers pretty much back me up: 861 in PCMark 8's Creative Conventional test, and 1,485 in the Work Conventional. PCMark 8 is probably the best measurement tool here, as it's a test of basic office tasks like browsing, word processing, and working on spreadsheets. HP's first-generation Stream, with its similar but slightly faster Celeron N2840, spits out about 1,774 in PCMark 8 Work Conventional. And yes, both the HP and the 100S-11 are definitely faster than the original netbooks. Running PCMark 8 Work Conventional on an old Lenovo Ideapad S12 with its Atom N270 barely pulled down 880. Battery life was very good: The 100S-11 wrung 8 hours and 41 minutes from its 31.9 Watt hour battery where we loop a 4K Ultra HD video using Windows 10's Movies & TV app. One thing to note: Our test normally plays the video at 250 nits to 260 nits in brightness. The 100S-11 screen maxes out at 200 nits, so it's a bit difficult to compare directly with other devices we've reviewed. 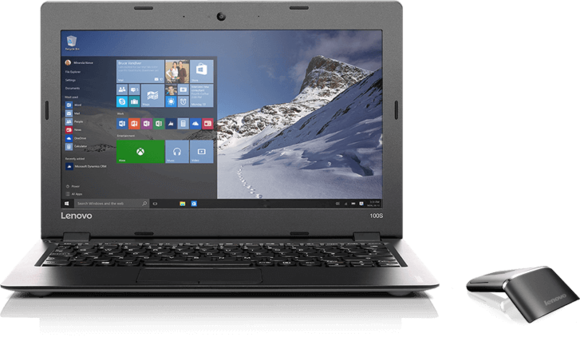 Either wait for the 64GB version to appear (yes, I've said it multiple times now) or check out the entry-level $249, 14-inch Ideapad 100S-14 with 64GB. Assuming of course, the latter is up to the 100S-11's standards. Unfortunately, I have no direct experience with the product, as Lenovo wasn't able to provide us with one in time for this article. 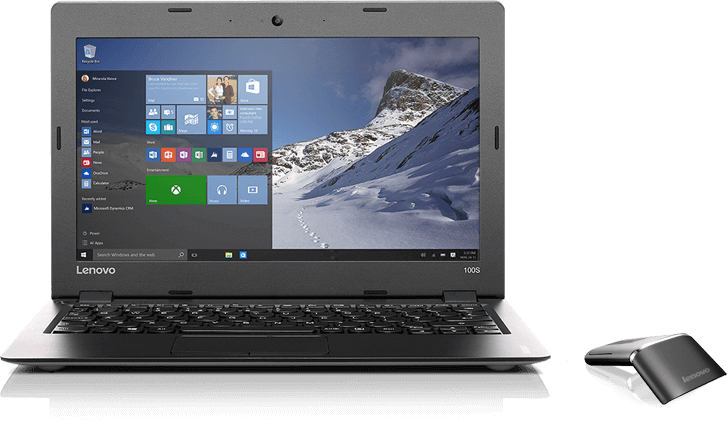 The 100s-11 has more the feel of a small laptop than the netbooks it descended from. The price is extremely tempting, but 32GB of storage is frustratingly small for a Windows machine. Wait for the 64GB version unless your computing needs are light in the extreme.